Last week we were treated to Bruce McDonald's excellent three-part documentary on the rich history of Yonge Street's musical scene. Among the many delights of the film was the glimpse it offered of a time when Toronto's main drag was vibrant, messy and notably absent of a corporate presence. Even as the music migrated elsewhere, downtown Yonge retained its mom and pop stores and signage for years, until around the mid 1990s when the stretch between Gerrard and Dundas started to lose some of this particular charm to the arrival of more and more chain stores. Needless to say, that process has continued to the present day. While small businesses haven't disappeared altogether, the area around Yonge and Dundas has witnessed a significant amount of development. There may, however, be an end in sight to the encroachment of big-box retail along the street. A new study to be conducted by Marianne McKenna and Ken Greenberg of KPMB Architects over the course of April will look at ways to foster what local councillor Kristyn Wong-Tam calls "a cohesive and clear identity for the strip." Funded by local stakeholders, including Ryerson University, Wong-Tam pushed for the study in response to concerns that the unique character of the street is slowly eroding. "The stretch of Yonge between Gerrard and Dundas is a unique block, still made up of predominantly three-storey, small format retail. We need to ensure that this streetwall remains vibrant and that the shopping and dining experience is unique," says the councillor of the heavily trafficked corridor. 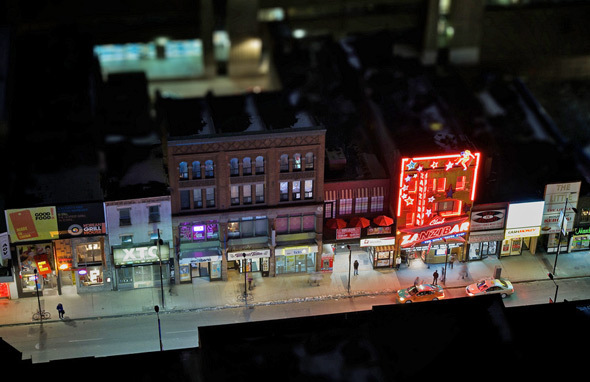 "What makes Yonge Street special is that it has been a major cultural destination. So we're looking at how to ensure that small to medium size business remain viable." Some of the ideas under discussion include restricting building heights in the immediate vicinity (an initiative already implicitly supported by last year's Tall Buildings Study), restoring heritage properties, and "programing" street tenants. When asked about the last idea, Wong-Tam explains that local stakeholders would look "to actively solicit certain types of restaurants and stores. Essentially, we'd want to fill the existing gaps so the street has some unique tenants. There's nothing wrong with the big chain stores, but diversity is crucial." Another key recommendation is expected to be a pilot project that would see a pedestrian mall return to Yonge Street. When asked how this would serve to encourage commercial diversity in the area, Wong-Tam notes that current "pedestrian experience on the sidewalk is so crammed that it's difficult to appreciate the area and its architecture." While she stresses that the plan is in its infancy and by no means a sure thing, local businesses are excited at the prospect of participating in such an experiment, even if it's just for a few weekends in the summer. "There's a desire for pedestrians to engage with Yonge Street differently. The BIA likes the idea, and so does Ryerson. We also have the support of Transportation Services." To become a reality, the plan would first go to community council, and then, if approved, to a vote at city council. But given the current makeup of council, one wonders if a pedestrian-oriented project such as this stands a chance. "I'm aware of the political advocacy for the driver, but the mayor is a good businessman," Wong-Tam offers in response to skeptics. "We don't want downtown Toronto to be suburbanized. We need as many pedestrians as possible." I'm not sure if Ford and his supporters on council will necessarily agree with these sentiments, but given the mayor's propensity to stick up for the "little guy," if the local businesses are game, perhaps this pedestrian mall stands a chance. Either way, I'm anxious to see the finished study and how it might help to restore such an important corridor in Toronto. Photos by Gadjo Sevilla and Ben Lean, respectively.